SAN JOSE, Costa Rica– January 13th, 2014 will mark the official end of an airline. This time is for LACSA (Lineas Aereas Costarricenses S.A.) that was formed by Pan American World Airways in 1945 and was the Costa Rican flag carrier ever since. The airline was owned by the Costa Rican government and domestic investors until 1991 when Federico Bloch from TACA International Airlines purchased it and merged it into the TACA Group. Since June 1950 LACSA operated a flight between San Jose (the Costa Rican capital) and the city of Miami. For many years the flight numbers 620 and 621 were used to identify the San Jose-Miami-San Jose run. The route was operated with Curtiss C-46 and later Douglas DC-6B. The airline received its first jetliner, the British BAC-111-400, that was promptly used for the Miami route. Later on LACSA upgraded the fleet to the BAC-111-500 and in 1979 the airline received its first Boeing 727-200 Advanced brand new from the Seattle manufacturer. After LACSA was absorbed by TACA International the flights to Miami changed its recognized flight number, but kept being marketed with the LACSA two letter code: LR. On 2009 the TACA Group was merged into Colombian flag carrier Avianca. In May 2013 Avianca decided to shut down the original LACSA hub at San Jose’s Juan Santamaria International Airport, suspending all the non-stop flights from Costa Rica to the United States. The only flight that was kept was the Miami bound flight. In December 2013 Avianca decided to finally suspend the flight, thus ending 64 years of uninterrupted service between the Costa Rican capital and Miami. January 13th will be indeed the end of an airline. RIP. 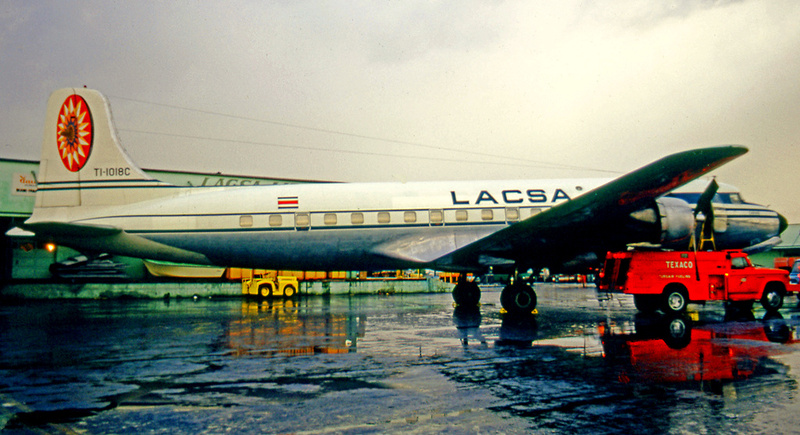 In the 1950s LACSA operated the Douglas DC-6 from San Jose to Miami with an intermediate stop in Havana, Cuba. This entry was posted in Airlines, Costa Rica, Defunct Latin Airlines, Latin American Airlines, Latin American Airports, Latin American Flag Carriers and tagged Costa Rica, Grand Cayman, LACSA, Pan American World Airways, San Jose.